A Knaresborough resident accused Harrogate council of being ‘weak’ as a controversial development for 120 houses was granted approval, despite opposition. 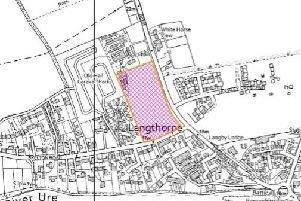 Seven out of the 11 councillors on the planning committee voted to approve the plans by Gladman to build 120 dwellings on Boroughbridge Road. But before their decision had been made, Knaresborough resident, Kelvin Wane, told the committee that developers were able to take advantage of ‘weak councils like Harrogate’ and urged them to refuse the plans. He said: “Gladman have no interest in Knaresborough or, indeed, in building houses, their only interest is getting planning approval and selling it to developers. “When you come into Knaresborough there is a big brown sign that says welcome to the historic market town of Knaresborough. On the right is an ugly development of mismatched homes with no spacing, there is nothing historic about it, it looks truly awful. Mr Wane went on to criticise traffic levels in the town and said the new development would create 480 more car journeys through Knaresborough. Mr Wane also highlighted Bond End’s pollution problem. “Developers seem to have selected my house as ground zero for development. Mr Wane told the council to send the developers ‘back down south’. Chairman of Scriven Parish Council, Councillor Ivor Fox, also spoke at the meeting and expressed concern over the plans. Coun Fox told the committee the parish council had sought pro bono legal advice which suggested Harrogate Council were trying to ‘rush’ the application through. Coun Fox also criticised the £1.5 million roundabout at the pastures, which he said was ‘still not complete’, and suggested that approval of the application would see further ancient hedgerows destroyed to create ‘unnecessary access’.